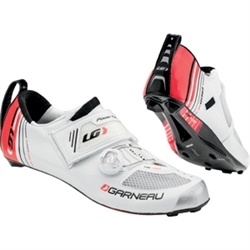 Triathlon shoes reach a new level of performance and comfort with the TRI-400 shoes. The Power Flex strap, a reversed hook and loop fastener closure, is combined with the ultra-light BOA IP1 system for amazing support without pressure points. The Carbon HM X-Lite outsole with titanium inserts is ultra-light and rigid for better power transfer, and the 4.3 mm carbon platform brings your feet closer to the pedal for even more power. Inside the heel cup, the HRS-400 retention system with a 2 mm membrane holds the heel firmly in place, reducing loss of power and preventing blisters caused by the irritation of an awkward fit. The Ice Fil insole, mesh upper and patented air channel system provide the ventilation to keep your feet cool and dry. Triathlon shoes reach a new level of performance and comfort with the TRI-400 shoes. The attach system features Boa® technology for amazing support without pressure points. The Carbon Air Lite outsole with titanium inserts is ultra-light and rigid for better power transfer. The retention system prevents blisters caused by the irritation of an awkward fit. The ventilated insoles with patented air channel system drains water and keeps your feet cool and dry.